Do You Think Marketing Should Engage and Entertain? Because we’re storytellers and artists, we believe the most effective stories are told with a combination of language and art. We’ll help you tell your marketing stories engagingly and entertainingly by creating comics and campaigns that engage and entertain your prospects, even as they educate them about your products and services. If you’re ready to let your marketing be another way in which you differentiate yourself from your competition, join the club. Simply put, we create marketing materials that get noticed. Whether it’s a cartoon, a strip, or an entire campaign with recurring characters that help establish memorability for your brand — whether it’s for your website, for your newsletter, for direct-mail, for email, for one-off ads, or for entire promotional programs — we package your message with persuasive humor. Then we help you decide the best means by which to reach your target audience. We do these things successfully because we combine award-winning marketing, advertising, and brand-management specialization with the award-winning talent of a nationally syndicated cartoonist. Most important, even though O’Brien Communications Group and Nate Fakes Cartoons existed long before BizComics, we do these things because we have fun. And we love sharing that fun with our clients. We schedule a conversation with you to understand your objectives, your target audience, the tone and style of the message you want to convey, and the medium in which you’ll distribute the finished product. Then we write a script and submit it to you for your approval. Once you approve the script, we create a rough sketch of the cartoon, the strip, or the campaign and submit that to you for approval. Once you approve the finished product, it’s ready for distribution. If you need our help with distribution, we’ll distribute it for you — or we’ll work with you to ensure the distribution is appropriate, as well as smooth, efficient, and cost-effective. It depends on what we need to do. Achieving your objective(s) might require a single-panel cartoon, a multi-panel strip, or a campaign of cartoons, strips, or both. We can also help with email distribution, as well coordinating print production and fulfillment. But we can’t know what the work will cost until we talk with you. * Our fees are alway separate from out-of-pocket expenses like email services (Constant Contact, iContact, MailChimp, et al. ), printing companies, and fulfillment houses. Those expenses we pass through to you at net. No markups for anything. Ever. We guarantee that, too. And we’re ready to learn yours. 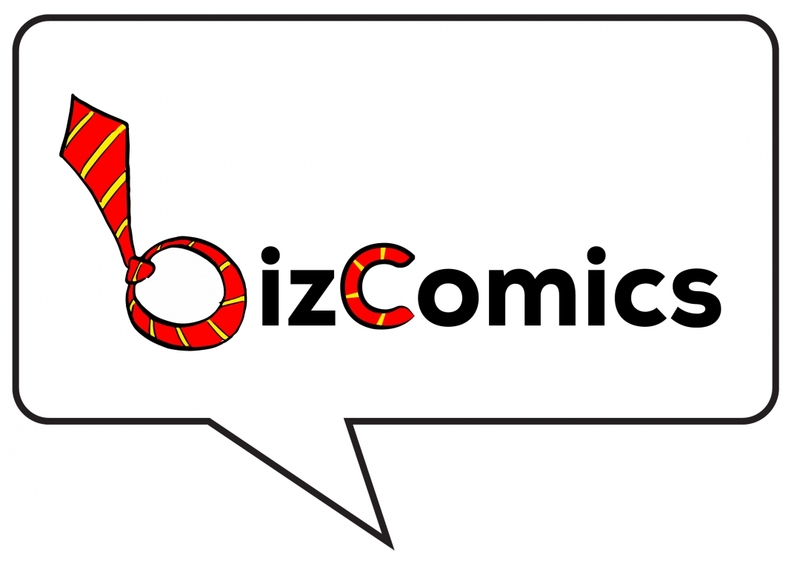 BizComics is a collaborative venture of O’Brien Communications Group and Nate Fakes Cartoons. On the heels of our successful strip, Thought Leadership, we wanted to give you the opportunity to discover what we did: Comics engage and entertain — and humor is universally appealing. Whether you want a single-panel comic, a multi-panel strip, or a complete campaign with scheduled distribution to your target constituents, we’re here to help. And we’re as close as your phone or your keyboard. Contact us to find out how you can start attracting more attention, more brand awareness, and more prospects. Our comics are funny. But lost opportunity is no laughing matter.